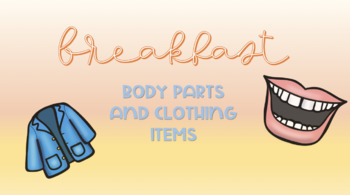 A breakfast set of sensory stakes designed to target both body parts and clothing! 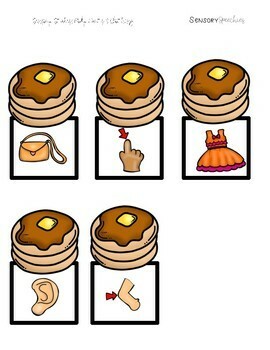 These are meant to be used as activities corresponding with our Breakfast Sensory Tins to encourage hands-on learning using multi-sensory input. This product includes 20 sensory stakes including: body parts (nose, eyes, mouth, etc.) and clothing (hat, pants, jacket, etc.). 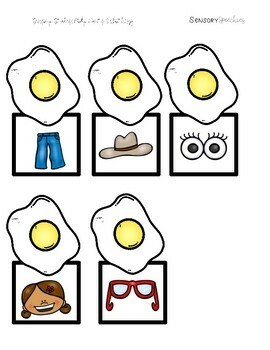 These stakes can target both receptive and expressive language skills as well as categorization body parts vs. clothing items.